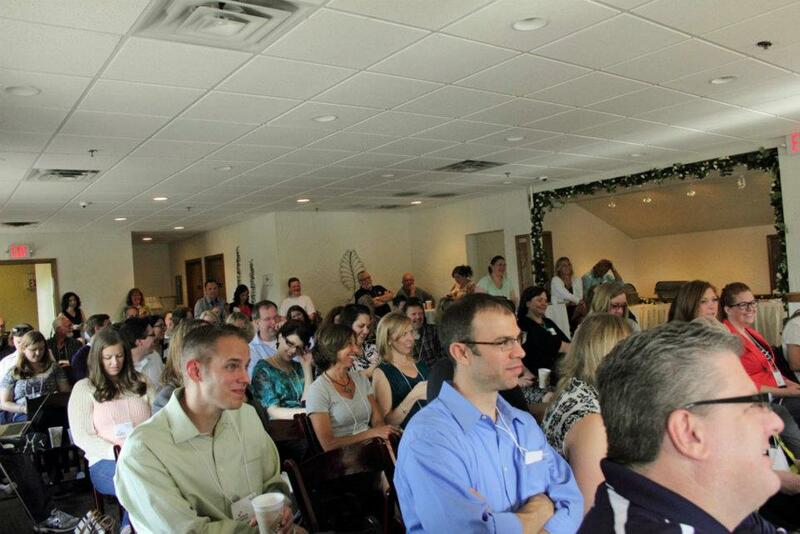 I attended the Social Media Breakfast – Minneapolis/St. Paul last Friday for the first time. I am surprised that this was my first event, but I am so glad I went. The speaker was Paul DeBettignies, and the event was held at Stanley’s Bar Room in Minneapolis. 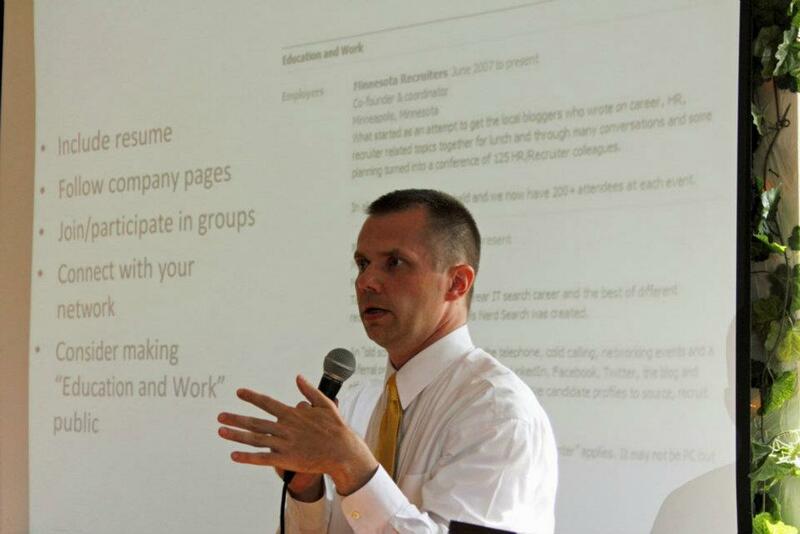 Paul is a well-known headhunter in the Twin Cities, and I was so glad he was the speaker. He is very knowledgable and is good about throwing jokes into his presentation to avoid that boring “someone talking at you” thing. I learned a lot of good things, and I’m glad to share a few of them with you. Paul started off comparing job searching to dating – am I wearing the right outfit? Should I call two days after? Or should I email? Did they like me? To be honest, job searching is like dating! You should LOVE your career. Just like dating, you shouldn’t settle for something, but search for something that helps you be the best you can be. Enough of the corniness, let’s move on to the good information. 1. Quality, not quantity: You don’t need more contacts, you need deeper relationships with your current contacts. You’re connected to 200 people on LinkedIn and you barely know them? Send someone a message, ask them to join you for coffee and talk about your goals, ask them for advice. 2. Take control of your job search: Don’t wait for a recruiter to contact you, seek people out. Attend networking events. Make it clear that you’re job searching to your friends, find out who they know and how you can get in touch with them. Be proactive and sell yourself. Would you hire yourself? Would you call yourself back? 3. Create a portfolio: You need to show what you can do. What’s a better way to do that than to have a portfolio Whether it’s a website or blog, make sure it’s strong and a good representation of your work and your personality. 4. LinkedIn: LinkedIn is a great tool, and there was a lot of discussion around this. First of all, do not link your Twitter account to your LinkedIn profile, unless your tweets are strictly business. If you’re connected with your boss on LinkedIn and you don’t want it known that you’re job searching, make your profile updates private while you update your profile. Then, when you’re done updating, you can make your updates public again. That way, those you’re connected to won’t see that you’re updating. 5. Resume: If you’re going to be making a move in the next 9 – 12 months, start looking at job posts now so you can get your resume in shape. Whether you’re completely content in your career or ready for your next big move, all of these tips are helpful. Keep your LinkedIn profile up-to-date and never share or post anything that you wouldn’t want a hiring manager to see. In addition to the great presentation, the 2012 Minnesota Blogger Conference was announced. It will be held on Saturday, September 22nd 2012 at Allina Commons in Minneapolis. I’m excited to be on the planning committee this year. Last year’s event was a huge success, I learned so much and left completely inspired. This year will be just as great! The website is actively updated and they’re active on Facebook and Twitter. Do you follow podcasts? I have a couple management podcasts on my iPod that I’ll listen to during a work out. I have a new one that I am excited to add. I recently came across The BeanCast marketing podcast and listened to my first show tonight! I am very impressed. I also had the opportunity to meet Mr. Bob Knorpp over the weekend and wish we would have had more time to talk marketing! The BeanCast is a round table discussion between Bob Knorpp and various people that are in the marketing and advertising industry. In the most recent podcast from 1/31/11, Bob talks to Scott Monty and I wanted to share this information because my professor from Promotional Communications last term talked a lot about Mr. Monty. I think anyone that is a marketing student or in the industry should add The BeanCast to their podcast subscriptions. A great part of the podcast is towards the end, when Bob asks each guest what stories they’re watching in the industry. This is great, and a great way to find new things happening in the industry. Bob, keep up the great work on The BeanCast! I am doing the Polar Bear Plunge. When you live in Minnesota, you need to embrace the cold winter. Otherwise those 3-4 months can seem so unbearable. My winter will most definitely be exciting. In January I will be running the Securian Winter Run 5k! This will be fun! I did it last year as my first 5k. I spent the rest of 2010 working on getting better at running. I feel confident with this 5k and will spend January preparing. I also have a few friends joining me and even doing the half marathon! Way to go! Also, this is a part of the 125th Saint Paul Winter Carnival, so there will be many activities happening in downtown Saint Paul! February will be a cold month and I’ll be jumping into frigid Minnesota waters with an awesome team for the Polar Bear Plunge. The Polar Bear Plunge is a fund-raiser for the Minnesota Special Olympics. I am so excited to be a part of this with so many great people. People keep telling me I am crazy for doing this but I never second guessed it. I am thankful that I have the ability to be able to do this for those who cannot. Check out our team page! And here is my personal plunger page. If I surpass my $400 fundraising goal then I will plunge in a bikini! What a great way to raise money for the Special Olympics! AND in March I will be in the wonderful town of New Ulm, Minnesota for BOCKFEST. If you’re wondering what Bockfest is… I am also “wondering”. I have heard a little about it, a celebration of a German town and the Schell’s Brewing Company in town. All I know is that I’ll be heading down with a friend and we’ll be dressed up in the ultimate Minnesota outfit, Sorel boots and bomber hats with blaze orange jackets. Keeping busy in Minnesota in the winter is key. In fact, I think I am doing more this winter than I did the past summer. I like to spend my summers relaxing and going to the cabin on the weekend with no big plans. I stumbled across this great job posting board on Ad Fed’s website. Check it out. In today’s new social media empowered world, Twitter is a marketing and advertising powerhouse. Marketers can use Twitter to get the word out about their blogs, new products, happenings in the company and many more things. One of my favorite advertising “tweeps” is @AdAge. Ad Age, obviously, is Advertising Age, which is a publication for marketing and advertising news. They have the online component as well as a print version. 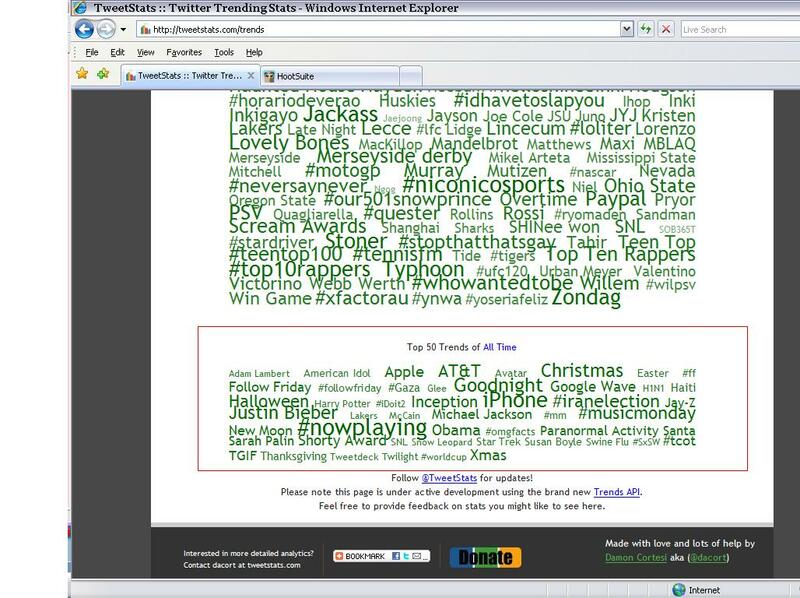 I stumbled across TweetStats and was quite surprised to see Justin Bieber as a top trend. OK, I wasn’t surprised but really to me it goes to show that The Biebs and his tween-following trumps… well, everything. He’s right up there with iPhone, AT&T and Christmas. A smart marketer could use Twitter and follow the trends to create different advertising campaigns depending on the market and goals of the campaign. As a student and young professional, being well-versed in Twitter and it’s many components could be ideal for a future job. You never know if a job you’re applying for will want you to be familiar with social media. The way I see it, in the next 5 – 10 years it’ll be a great thing to have on your side. By the way, in the time it’s taken me to write this post (about 15 minutes), the tweetstats have updated! How interesting! I love being able to do things online. Specifically, being able to use the internet and a company’s website to avoid calling there! One of my best friends wants to get her hair cut at Phresh. Their website is AWESOME. Not only can you find out information about the salon, but you can price out services, find out about products and get basic information on each stylist to see which stylist you may want! I knew who my friend was wanting to use for her stylist, so I was able to log into the online booking system to see if she had appointments available when Ella was available. I was able to email Ella with her available appointment times. Ella wanted to know if they accepted checks, and I was able to find that under the salon policies page! Thanks to Phresh for being so innovative and having a great website, elimating me from having to call when I can just find the information online. 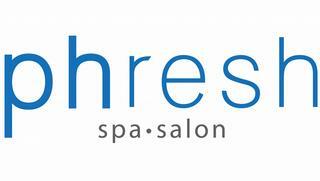 PS: If you’re in the market for a new salon, Phresh is great. It’s located on Grand & Milton in St. Paul. Every stylist does exactly what you want and they offer great suggestions if you’re unsure. The prices are reasonable for such a nice salon ($25 +) and the products they use are amazing. There is never a pressure to buy and the staff are very friendly.